Cool down with a nice glass of Watermelon Cucumber Coco Lime Mint Juice! This super fresh juice will make your tastebuds sing! After ingredients are prepared toss everything into the blender and liquify! Except the mint, to keep the juice a nice pink colour. ( Also the reason why I ditched the cucumber skin.) You could pulse the mint once or twice once the juice if fully blended just to break it up. I chose to muddle it and then add as a garnish at the end. Once Liquified – Set strainer on top of a jug. Slowly pour juice through the strainer. I assisted the process with the back of a big spoon. Muddle the mint, and toss it in. Save a small piece to set on top as a garnish… If your feeling fancy like that. #KABOOM! Talk about a fresh kick to the taste buds! This was exactly what my mouth needed when I got my wisdom teeth out this past week! It is also perfect for the piping hot weather we have been enjoying here in Toronto! 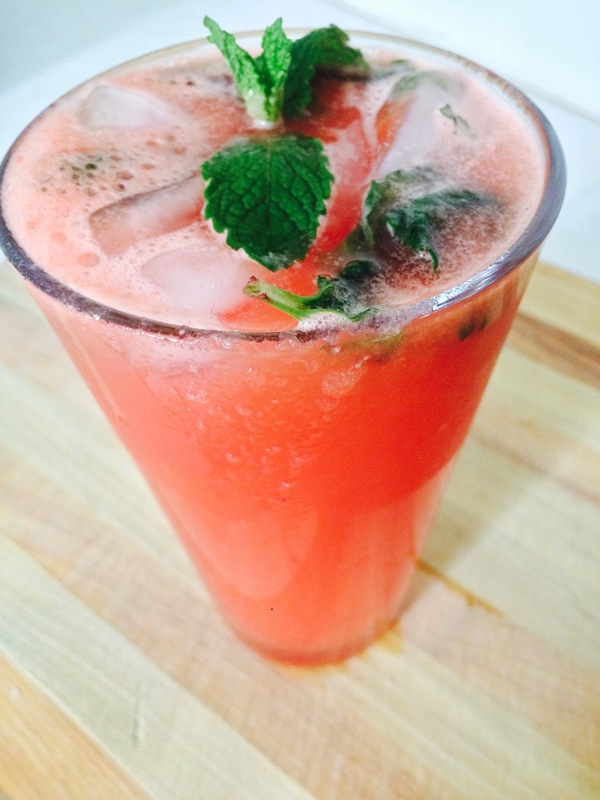 Watermelon Cucumber Coco Lime Mint Juice will be sure to make your friends beg for more… SO maybe make a few batches! This batch alone fills up a pitcher… SO if you have 4 pitchers or a massive jug… Go to town! It would be worth your time if you were having a party. If you really wanted to kick things up you could toss a bit of vodka, rum, or gin in there. For me… I like to keep it virgin! XOxO Love within, love around. Wow! That looks sooo tasty & you make it sound so easy to make! Thanks for the recipe!